Our new dryer is both solar and wind powered. In fact, if you take into account the amount of chocolate that I eat and the fact that I'm the one who hangs out most of the laundry, you could say it's also chocolate powered. About a month ago, our dryer stopped working. And instead of rushing right out to get it fixed, we decided to make use of the laundry line that, until now, has served no purpose other than as a framework for sheet tents. Here are some of the pros. -It takes me anywhere from 5 to 10 minutes to hang out a load (depending on whether it's mostly towels or socks) and about a minute to take it down. 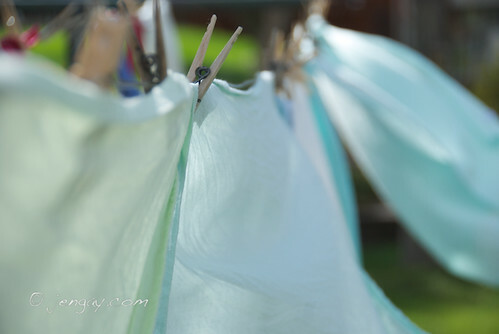 -Most days, a load of laundry actually takes less time to dry out on the line than it would have in the dryer. -According to the California Energy Commission, the dryer is the "second-biggest electricity-using appliance after the refrigerator." -According to Lance, hanging out laundry burns over 130 calories per hour. And that doesn't even count the calories burned lugging a basket of wet laundry up the stairs from the basement. Which you know means I'm able to refuel myself with more chocolate. I believe that this is the best perk of all. -Even though a lot of the time it's just jeans and t-shirt out there flapping in the breeze, sometimes my laundry is pretty enough to make me smile. For those of you who've never hung laundry on a line, here is the one tip that I always hear in my mother's voice every time I hang out a load. Hang towels on the outside and undies in the middle. Unless of coarse you've got beautiful underwear, in which case flaunt those puppies. Annah, the laundry's mine, but my sister took the photos. I do use a ton of her work here... if it's got the jengay.com watermark, they're hers. The ones without the watermarks are mine. 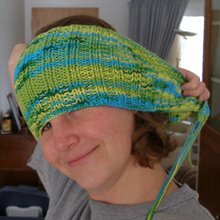 If you like these, you should check out her site. I used to hang laundry at our house in Monroe, and loved looking at it! However, it takes forever and a day for our laundry to dry here in Georgia because of the humidity, so I do use the dryer. You have another new header ... I love it! I'm especially fond of moss on wood for some reason, and will stop to look whenever I see it. LMFSocks off! or pretty undies if I had some! 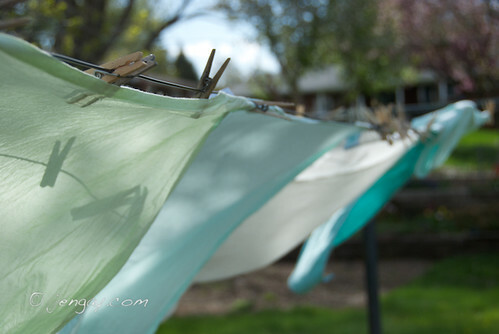 Hanging laundry is so great, you save energy, burn a few calories and get five. FIVE whole minutes alone in your own head. Aaah.....even if you just hang sheets and towels. ( they're easy for crying out loud! ;) )and it is oh. so. pretty. oh i love our laundry line, they are just the best, aren't they? After our ridiculously rainy Spring, it's sunny and breezy enough to use our excellent laundry line... and now we have to move! Thanks for reminding me that it's a summer priority. Around here there are some areas that don't allow outdoor lines, so we'll do our best to stay away from those. My mom used to put "big stuff" on the outside to make it dry faster. I don't think she actually said "undies on the inside" she DID say, "Remember: the neighbors can see our line". Even when we did have a dryer, we often hung loads on hot days, sometimes putting them through an air cycle spin for a little more softness for a few minutes. 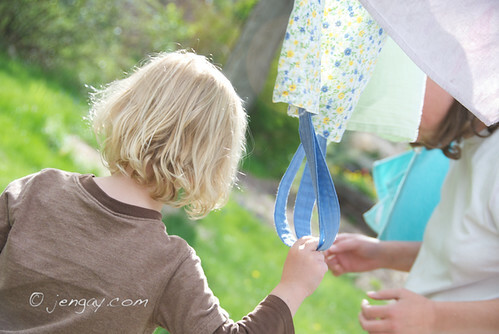 I remember hanging laundry back in the day! It's certainly more green and economical than using the dryer. I haven't really seen laundry lines though since moving to CO ten years ago. Nate and I do however, have this wooden thingymajigger that we brought from maybe Target? We're able to hang about at least ten shirts which helps lessens the load thrown into the dryer and the drying time.